Saturday, September 23, from 11 a.m. to 3 p.m.
First 500 people get a FREE "emergency starter kit from CHOMP. Join us this Saturday at Del Monte Center. 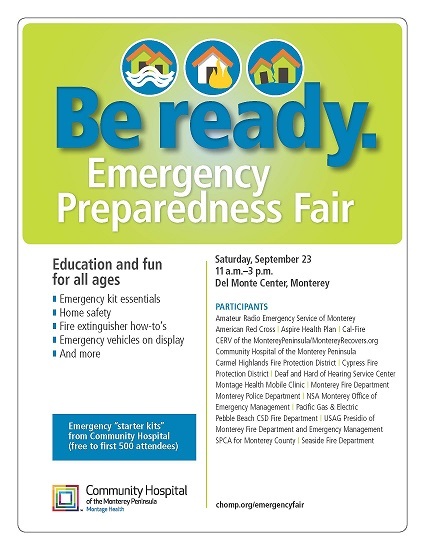 Talk to representatives from the Red Cross, Amateur Radio Emergency Services, Cal-Fire, CERV of the Monterey Peninsula, CERT programs, Monterey Fire and Police Departments, the Pebble Beach, Presidio, Seaside, Cypress, Carmel Highlands Fire Departments, SPCA for Monterey County, PG&E and other groups. This yearly event is sponsored by the COMMUNITY HOSPITAL OF THE MONTEREY PENINSULA (CHOMP). Thanks to CHOMP and Del Monte Center.